Can’t find that flyer about a school event that you saw in the Les Annonces de La Semaine? Have you misplaced the sign-up sheet for Parent Teacher Conferences? 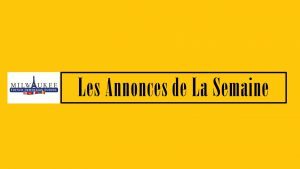 Click on one of the hotlinks below for access to a PDF of previous Les Annonces de La Semaine material.